.."blending old-world romanticism with contemporary haute couture"..
Like many fashion designers, Melissa Gentile's love of all-things-art inspires her garment designs. When it comes to her wedding gown collection, this influence is especially apparent. She may have been born and raised in Montreal, but Gentile infuses a distinctly European sensibility into her fashion business, blending old-world romanticism with contemporary haute couture. French for "high sewing", haute couture is a term used to describe custom-designed and custom-fitted garments. Haute couture clothing is made-to-order, which means that the customer doesn't just select a "ready-to-wear" garment off the rack - instead, customers have their measurements taken so that a high-quality garment can then be handmade to suit their specifications. In France, the term "haute couture" is governed closely by French law, and only companies which meet certain standards are permitted to use the label. Many global brands, such as Chanel and Christian Dior qualify as haute couture, but also carry an additional ready-to-wear line, which is what the public is most familiar with. The following six selections from Gentile's spring 2009 bridal line aren't your typical "plain white strapless" numbers. Gentile's gowns are handcrafted from a selection of luxe fabrics such as French lace and Italian silk, and are adorned with sparkling details such as Swarovski crystals. With its bountiful bustle and cathedral train, this gown is bound to make any bride who wears it feel like the belle of the ball! The sweetheart neckline bust is crafted from silk duchess satin and draped with French Alencon lace, while Swarovski crystal embellishments accent the mid-section of the gown. The ballgown skirt, constructed from silk dupioni, features an assortment of extravagant bustles and pleats around the hem. This gown is available in both White and Ivory. 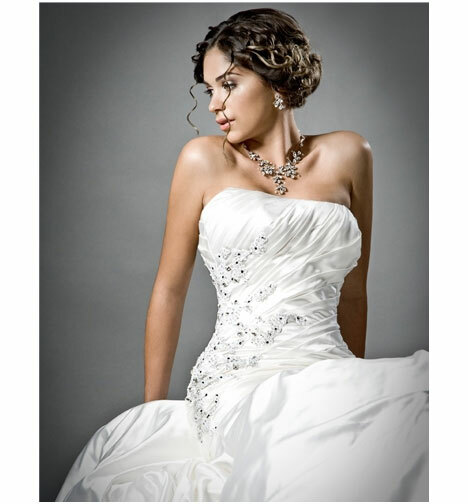 This strapless number is fitted to flatter throughout the torso, and then features a dramatic drop-waist flare for the skirt and chapel train. Crafted from silk duchess satin, this gown's draped bodice is adorned with breathtaking Swarovski crystals and lace appliques, lending an overall sparkling softness to the garment. The side of the skirt is gathered with a handmade silk flower for a fine finishing touch. This gown is available in both White and Ivory. A deep v-neck gives this strapless gown a dramatic decolletage, and creates a space that's perfect for accenting with a vintage necklace. The fitted drop-waist celebrates the feminine physique, while the pleated skirt adds a purely modern touch. 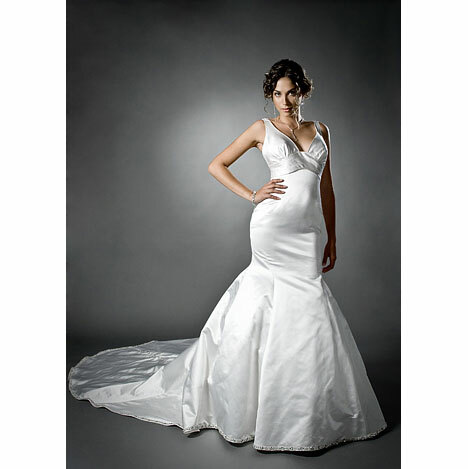 This gown is available in both White and Ivory. For the bride who prefers straps but finds them hard to come by on a modern gown, this dress is not only secured with straps, but straps embellished with Swarovski crystals! With a dramatic, plunging v-neckline, this gown, crafted from silk duchess satin, is known as a "mermaid" style, due to its fitted drop-waist and flared skirt, which resembles a fishtail. This dress is available in both White and Ivory. 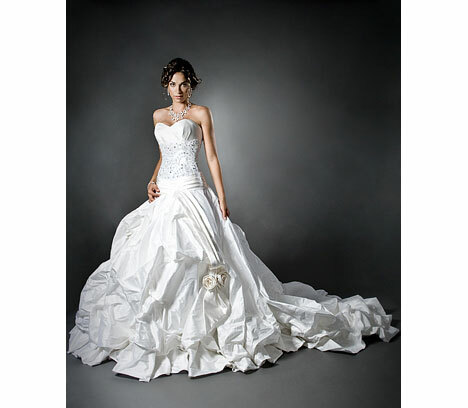 With its strapless sweetheart neckline and dramatic floral detailing, this gown is full of flair and femininity. The bust features silk chantilly lace and silk dupioni pleating, while the flared skirt, embellished with silk tulle flowers and Swarovski crystals, trails into a breathtaking cathedral train. This gown is available in both White and Ivory. The knee-length of this strapless sweetheart number makes it perfect for a destination wedding, where a bride is free to wander the sandy shores without worrying about tripping on her hem! Slight draping at the bust and unique silk dupioni ruffle embellishments on the skirt ensure that this gown makes an impression, while a Swarovski crystal hand-beaded trim at the waist adds a perfectly pretty finishing touch. 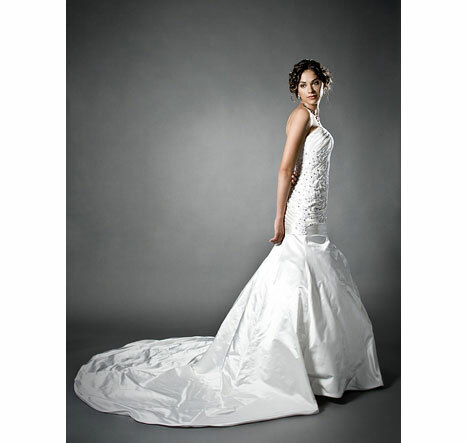 This gown is available in White, Ivory, Black, and Silver. You can view the entire collection on Melissa Gentile's website. To find the Haute Couture line in a bridal boutique near you, use our Gown Finder, search for Melissa Gentile Haute Couture.